Last night, Motorcycle Parking was on the agenda for Manhattan’s Community Board 4 (CB4) Transportation Planning Committee after the abrupt removal of the traditional motorcycle parking on the Dyer Ave. triangle at W35th st. Members of the NYMSTF as well as local riders, residents, and business owners attended to express their opinions and resolve to address motorcycle parking issues. Request DOT to implement motorcycle only parking at the endcaps of every bicycle corral where striped space is created but there is no room for a car. The above was approved by all board members, save one abstention and one vote against. We’ll post the full text of the resolution when it becomes available. Next, the Transportation Planning Committee will present their resolution to the full CB4 board for approval, Wednesday, June 5, 6:30 p.m. 119 Ninth Avenue (betw. 17th and 18th Sts), Fulton Auditorium. This will also be a public hearing and it will be important for riders to come to show their support for the resolution. Finally, it will be up to the DOT to execute the community’s wishes and establish these parking areas. As promised, the New York Motorcycle & Scooter Task Force has gotten the Dyer Ave. Triangle / Midtown West parking situation on the agenda for CB4. Last week, motorcycle parking on the Dyer Ave. triangle at W36th street was dismantled with just 24 hours’ notice to riders. We fear that loss of this sanctioned motorcycle parking zone will lead to a switch to more automobiles, or to parking their two-wheelers on sidewalks, as they try to avoid being knocked over by cars. In September, 2010, Manhattan Community Board 4 (CB4, which represents this area) resolved for end-of-block motorcycle-only parking at three locations, to resolve the problem of two-wheelers getting knocked over, and to create “daylighting” visibility for pedestrians and cyclists. Unfortunately DOT refused to implement these spots. Change in parking regulation for the two identified zones (520 9th Ave. and 462 9th Ave), to clearly posted “Motorcycle Parking Only” signage. Identification of additional zones in the vicinity of Dyer ave triangle, sufficient to accommodate about 15 additional vehicles (approximately 60 feet of curb space). Here’s what you can do to get back parking for your motorcycle or scooter. 1. Show up and be prepared to speak about your needs for parking in the neighborhood. Be on time, polite, clear, and brief. Explain how you live, work, or shop in the area, and what your transportation options are (or aren’t). How many miles per gallon do you get, how much room do you need to park, how often do the trains run when you get off work? When riders in the community speak, representatives listen. 2. Help us get the word out. We need you to forward this e-mail to a friend who rides. It’s the only effective way for us to reach motorcyclists. 3. Be prepared. Help us scout out alternative parking spots for motorcycles and scooters. Reply to this e-mail and we’ll hook up with you to photograph and document potential spots. We need help putting together a package of pictures, diagrams, and resolutions for the committee to outline our program. Don’t wait for someone else to do it. This is your parking – now’s your chance to fight for it! Community Boards 2 and 4 in Manhattan have approved of eleven motorcycle- and scooter-only parking spots throughout the West Village and Hell’s Kitchen. However, the NYC DOT has refused to implement all but two of them. The NYMSTF is trying to put the pressure on DOT to install the signage that New York’s communities have voted for. We need you to write the Commissioner of the DOT and request that the motorcycle-only pilot parking program be implemented. Please promptly implement the motorcycle parking pilot areas that have already been approved by Manhattan Community Boards 2 and 4. Motorcycles and scooters are a practical and efficient means of transportation and are an essential element of mobility and logistics in the modern urban environment. Free Motorcycle Parking at Muni-Meters – It Can Happen with Your Help! There is proposed City Council legislation to exempt scooters and motorcycles from paying at Muni-Meters. No more wondering where to put your ticket. No more summonses. No more velcro’ed license plates. Finally: a real solution to parking at meters that were designed only for cars. The legislation, Int 0860-2012, was proposed by Peter Vallone Jr. of Queens. You can read the text here. 1. Call the bill’s sponsors and tell them you support Int-0860-2012. Tell them you live, work, or shop in their area and that it is a great solution for the constant threat of Muni-Meter violations for motorcycles. committee in support of this bill. You can find your council member’s name and contact information at http://tinyurl.com/nyccouncilmember. The bill isn’t scheduled for a public hearing yet, but as soon as it is we’ll contact you and solicit your help in telling your councilmember that you’re tired of the tickets, and that motorcycles and scooters are part of the solution to reducing congestion in NYC. If you know of other ways to help get this legislation passed, tell us in the forum or reply to this e-mail. Works Engineering, N Williamsburg, $125/moIf there’s anyone else out there, add it to our Shop Database! Still, be aware that a 4-month break from riding will absolutely dull your skills. Take it from the local government of Devon, U.K. 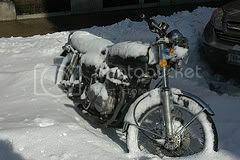 The November newsletter will have Winter Riding Tips for those of you ready to brave the cold.